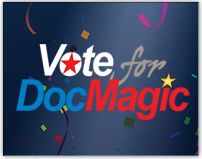 Press Release: The response has been high for the company's "Vote for DocMagic" online sweepstakes. DocMagic, Inc., a leading provider of fully-compliant loan document preparation and delivery solutions for the mortgage industry, announced today that hundreds of industry Facebook users have visited the company’s Facebook page at facebook.com/docmagicinc, voted for DocMagic's mascot for President and been automatically registered to win an expense-paid trip to Washington, D.C. The company announced the contest October 1 as part of its effort to use gamification strategies to build up its online following, which the company says is working.